Chiung, Wi-vun Taiffalo. 1999. Language Attitudes toward Taibun- the Written Taiwanese. Chapter 2. pp. 16-55. MA thesis: The University of Texas at Arlington. Section 2.1 introduces the ethnic groups and languages in Taiwan. Section 2.2 introduces the evolution of written languages in Taiwan. Section 2.3 sketch the modern movement of written Taiwanese. Section 2.4 introduces the main orthographies in the contemporary Taibun. The total area of Taiwan, including the main island and several small islands, is 35,961 square kilometers. The population of Taiwan in 1995 was around twenty one million (Ethnologue 1996). Generally speaking, there are four primary ethnic groups: aborigines (1.7%), Holo (73.3%), Hakka (12%), and Mainlanders (13%) (Huang 1993: 21). The Holo, Hakka, and Mainlanders are occasionally called Han people (漢人) and their languages are called Han languages in contrast to the aborigines. Even though they are called Han people and Han languages, they have different ethnic languages. That is, Holooe, Hakfa, and Taiwan Mandarin, are not mutually intelligible (DeFrancis 1990: 54-57). Some foreign languages such as Japanese and English are also used by Taiwanese people for the purpose of international trade. Besides, there are some new settlers such as Vietnamese and Filipino who recently married Taiwanese spouses. They were all omitted in my descriptions of ethnicity and languages in Taiwan. There are several aboriginal tribes who have resided in Taiwan for thousands of years. Today they speak about 12 languages, which belong to Austronesian-Formosan language family, and they live over the island of Taiwan (Ethnologue 1996). The classification of different tribes varies from scholar to scholar such as G. Taylor, 伊能嘉矩 (Yoshinori), 鳥居龍藏, and Paul Li. Those tribes were divided into two distinct groups based on their social and ethnic relations with the Han people. First, Sek-hoan (熟番; ripe barbarians, sinicized barbarians) or Penn-pou tribes ( 平埔; plain tribes), which means they were more under daily Han control, and they mainly resided in the plains of western Taiwan. Second, Chhenn-hoan (生番; rude barbarian) or Ko-soann chok (高山族; mountain tribes). They were more unfriendly (from the viewpoint of Han people) and less under daily Han control. Most of them resided in the mountainous areas. The Plain tribes include Katagalan (凱達格蘭), Kavalan (葛瑪蘭), Taokas (道卡斯), Pazeh (巴則海), Papora (巴布拉), Babuza (貓霧栜), Hoanya (洪雅), Thao (邵), Siraya (西拉雅), and Qaugaut (猴猴) (Li 1997b: 61). They were gradually oppressed by the Han immigrants from the late of seventeenth century onward. As a result, they started to lose their own languages and customs (Tsuchida 1991: 1). The "mountain" tribes include Atayal (泰雅), Saisiyat (賽夏), Bunun (布農), Tsou (鄒), Rukai (魯凱), Paiwan (排灣), Puyuma (卑南), Amis (阿美), and Yami (雅美) (Li 1997b: 61). The Holo people were the first immigrants in the history of Taiwan. They began to move massively to Taiwan after the Koxinga era in the second half of seventeenth century. The Holo people are also called Min-nan people (閩南人people of Southern Min). The ethnic language used by Holo ethnicity is Holo-oe, which is also called Southern Min. Moreover, Holooe is more widely called Taigi (台語) or Taioan-oe (台灣話), the Taiwanese language. The name "Holo" may be written in different Han characters and interpreted by different scholars as having different meanings. One assumption is 河洛 (Lim 1991: 7-8), which means the plains between the Yellow river (黃河) and the Lok river (洛水), which are the origins of Holo people. The second assumption was issued by Ang Ui-jin (1987: 148), who asserted that correct Han characters for Holo should be 絡獠. That means Holo people are the descendants of 絡獠, which was one tribe of Oat race (越族) in southeast China. Besides, Khou Kek-tun (1992: 10-14) asserted that the widely used term 福佬is more acceptable. That term means the people of Hokkian province (福建) . The Holo people of Taiwan were primarily from the Choan-chiu (泉州Quanzhou) and Chiang-chiu (漳州Zhangzhou), where were two cities of Hokkian Province in southeast China. According to the census done in 1926, 44.8% of Taiwan population were from Choan-chiu, 35.2% were from Chiang-chiu, and only 3.1% were from other cities of Hokkian (Khou 1992: 28). Generally speaking, Choan-chiu and Chiang-chiu are two dialects of the Southern Min language. There are some differences between Choan-chiu and Chiang-chiu, such as /koe/ vs. /ke/ to represent the same meaning of word 'chicken.' Although Choan-chiu and Chiang-chiu were originally two different varieties of Southern Min, they gradually merged and became a new "non-Chiang non-Choan (不漳不泉)" vernacular after they were carried to Taiwan (Ang 1992b: 71). Moreover, they were greatly influenced by the languages of plain tribes, and the Japanese language during Japanese occupation of Taiwan. Today, this new "non-Chiang non-Choan" language is widely called Holooe or Taigi (Taiwanese). Another immigrant group, aside from the Holo people are the Hakka (客家). The reason for Hakka migration to Taiwan was mainly because of restrictions of Ch'ing dynasty. Thus, Hakka migration is later than Holo people. For example, right after Ch'ing dynasty defeated Koxinga regime in 1683, the Ch'ing announced such restrictions as "people who lived in Tio-chiu (潮州) and Hui-chiu (惠州)(most of whom were Hakka people) were not allowed to move to Taiwan, because those places were suspected of being the bases of pirates." Such restrictions on Hakka were continued until 1760 (Su 1980: 129). Hakka means "guest" in Chinese. The name was due to their continuing immigrations in the history of the formation of Hakka (Lo 1933). Hakfa (客話, or Hakkafa客家話) is the ethnic language of Hakka people. There are two main Hakka varieties in Taiwan, that is, Si-yen (四縣) and Hoi-liuk (海陸). Si-yen means four counties. This was because Si-yen speakers were mainly from Moi (梅縣), Hin-nen (興寧), Chen-phin (鎮平), Chhong-lok (長樂) counties of the Canton Province of China. Hoi-liuk means Hoi-fong County and Liuk-fong County, because Hoi-liuk speakers were mainly from Hoi-fong (海豐) and Liuk-fong (陸豐) counties of the Canton province. According the census data in 1926, around 65% of Hakka population were Si-yen speakers, 35% were Hoi-liuk speakers (Khou 1992). Because Si-yen and Hoi-liuk speakers were settled in different places, they didn't mix as much as Holo people did, the distinction between Si-yen and Hoi-liuk still exist today. The third vast immigration of Taiwan was so-called Goa-seng-lang (外省人 Mainlanders or people from other provinces) or Sin-chu-bin (新住民New Settlers). In the year 1949, Chiang Kai-shek's army was defeated in China, and then he and his followers moved into Taiwan. Around 1.2 million Mainland Chinese, including soldiers and refugees, came to Taiwan along with Chiang's KMT political regime (Huang 1993: 25). Those soldiers and refugees were from all provinces of China where they spoke different languages such as Cantonese, Shanghai (上海), or Santong (山東). Owing to the linguistic diversity and national language policy, most of mainlanders have switched from their first languages to Mandarin Chinese. Therefore, the Mandarin language is generally regarded as the lingua franca among the Mainlanders. According to the census of 1988, 67.7% of the total population of Mainlanders resided in the Great Taipei area (Huang 1993: 26). The remaining Mainlanders are found in other metropolitan areas of Taiwan. Ong Hu-chhing (1993) pointed out that 54 percent of the Mainlanders still identified themselves as Chinese. Only 7.3% identified themselves as Taiwanese and the rest were neutral. Although most of Mainlanders identify themselves as Chinese, some regarded themselves as Sin-Chu-Bin (New Settlers) to show their strong identity with Taiwan. It means that they were the recent immigrant Taiwanese instead of Chinese. Moreover, they organized "Goasenglang Association of Taiwan Independence ([外省人]台灣獨立協進會)" to promote Taiwan independence in 1992 (GATI 1992). The ethnic relations in Taiwan are much more complicated than we can describe in this subsection. Gordon (1964) points out that intermarriage is the most difficult stage to achieve between ethnic groups. Therefore, we may use the proportion of intermarriage as an index to examine the current ethnic relations in Taiwan. In Hu-chhiong Ong's research, he divided his subjects into two groups (i.e., native Taiwanese (本省籍) vs. Mainlanders (外省籍)); 9.7% (125/1287) of them are intermarried. He further concluded that "although intermarriage is becoming more popular, the factor of ethnicity still plays a role on choosing one's significant other." (1993: 77-85). For more information about ethnic relations in Taiwan, refer to the works such as Ethnic Relations and National Identity (Tiunn 1993) and Ethnicity in Taiwan: Social, Historical, and Cultural Perspectives (Chen 1994). The language policy in Taiwan is usually specified as the "Guoyu Zheng-ce (國語政策; National Language Policy)." Guoyu Zheng-ce reflects the mono-lingualism of the colonial governments in Taiwan. Under this policy, only a particular language was chosen as the Guoyu, which means the official language or national language, and it would be considered the high language in diglossia. Other languages were denounced as "fang-yen (方言)," which would be considered the low language in diglossia. The Guoyu Zheng-ce was first established by Japanese during the Japanese occupation of Taiwan (1895-1945), where Japanese was chosen as the Guoyu. After Word War II, the Guoyu policy was continued by the new ruler, the Chinese KMT, with Japanese being replaced by Mandarin Chinese as the new Guoyu. The concrete procedures for executing the Guoyu policy may vary from time to time. Generally speaking, we could survey Guoyu policy through three dimensions: Education, mass communication, and language rights. In the education dimension, the education of native Taiwanese languages is excluded from the national education system. Moreover, students are not allowed to speak Taiwanese in school. For instance, the well-known terms "掛狗牌仔 (Hanging a doggie tag on someone's neck)," and "講台語罰一箍 (one Taiwanese sentence, one dollar), reflect the fact that students were punished because of talking in Taiwanese. In the dimension of mass communication, the Taiwanese languages in mass media are restricted and discriminated against by the Broadcasting and Television Law (廣電法1975). Jang (1993) pointed out that the proportion of native Taiwanese programs on televisions had decreased from 12% (1976) to 8% (1985). In the dimension of language rights, people are not allowed to use native Taiwanese languages in public places, such as post offices, theaters, and government offices. Moreover, even in the church, preaching in Taiwanese languages was not allowed until the most recent political reform. For instance, the government issued the order in 1957 that the use of Romanized Taiwanese must be banned, and Mandarin should be used in preaching. For references on Guoyu policy, see Huang (1993), Tiunn (1974), Png (1965), and Si (1996). The first written language in Taiwan was the Romanization written in Sinkang, a type of writing used by the Siraya plains tribe during Dutch occupation of Taiwan in the seventeenth century. Thereafter, the classical Han (文言wenyan) and Koa-a-chheh writings became the written standards during Koxinga and Ch'ing's occupations. In addition to those two written standards of Han characters, Roman scripts have been developed to write Holo and Hakka since the nineteenth century. After Taiwan became a part of Japan (1895-1945), Japanese writing became the official written language in Taiwan. After World War II, Mandarin Chinese became the official standard for writing under Chiang Kai-shek's occupation of Taiwan. As Campbell (1903) described, "during that period they (i.e., Dutch) not only carried on a profitable trade, but made successful efforts in educating and Christianising the natives; one missionary alone having established a number of schools and received over five thousand adults into the membership of the Reformed Church." (1992: vii). The natives around Sinkang were first taught Christianity through the learning of the Romanization of Sinkang dialect. The were some textbooks and testaments written in Romanized Sinkang, such as the The Gospel of St. Matthew in Formosan Sinkang Dialect and Dutch (Het Heylige Euangelium Matthei en Jonannis Ofte Hagnau Ka D'llig Matiktik, Ka na Sasoulat ti Mattheus, ti Johannes appa. Overgefet inde Formosaansche tale, voor de Inwoonders van Soulang, Mattau, Sinckan, Bacloan, Tavokan, en Tevorang. ), which was translated by Daniel Gravius in 1661 (Campbell 1996; Lai 1990: 121-123). After Koxinga drove the Dutch out from Taiwan, that Roman scripts were still used by those plain tribes for a period. There were several Romanized manuscripts found written in languages of native aborigines or in bilingual texts with Romanization and Han characters after those native languages had disappeared. Most of the manuscripts were either sale contracts, mortgage bonds, or leases (Naojiro Murakami: 1933). Because most of those manuscripts were found in Sinkang areas and were written in Sinkang language, they were named Sinkang Manuscripts (新港文書) by scholars, or Hoan-a-khe (番仔契 the contract of barbarians) by the public (Lai 1990: 125-127). There are 141 examples of Sinkang Manuscripts discovered to date, the earliest manuscript dated 1683, and the most recent one dated 1813. In other words, those aborigines continued to use the Romanization for over a century-and-a-half after the Dutch had left Taiwan (Naojiro Murakami: 1933). The classic writing system of Han characters (文言文) was the official written language before the twentieth century in the Hanji cultural areas such as Taiwan, China, Vietnam, Korea, and Japan (Chiung 1997). The classical Han became the official written language, much as Latin was in pre-modern Europe (Norman 1991: 78). In addition to those standard Han characters used for classical Han writing, there were some dialectal characters, which were more popularly used by local people for the purpose of vernacular writing. Such as Chu-Nom (字字 喃) in Vietnam and Koa-a-chheh in Taiwan. The Koa-a-chheh (song books) orthography was named because many traditional song books were written in this system. Each sentence was composed of either five or seven characters. They were not regarded as classical Han writing because they were written close to spoken forms. Even so, they were sort of different from the modern colloquial forms. Therefore, they should be classified as pre-modern colloquial writings. First, the same etymon is written with the same Han characters. Such as "想(siunn: think)" in the Koa-a-chheh sentence "蚊仔想著足怨切 (bang-a siunn tioh chiok oan-chheh: the mosquito was very sad while he thought about that)." Second, the meaning of a character was ignored; only the sound was attended to. For example, "足(chiok)" was supposed to be the meaning of "foot" in classical Han writing, however, it means "very (chiok)" in the Koa-a-chheh sentence above. Third, the pronunciation of a character was ignored, and its meaning borrowed to express the same meaning in different languages. Such as the meaning of "蚊" was borrowed to express "mosquito (bang)" in Taiwanese. If Sinkang writing represents the first foreign missionary activities in Taiwan, then the development of Peh-oe-ji (白話字) reveals the comeback of missionary influences after the Dutch withdrawal from Taiwan. More and more missionaries came to preach in China in the seventeenth century even though there were several restrictions on foreign missionaries under the Ch'ing Dynasty. The restrictions on foreign missionaries were continued until the Treaty of Tientsin (天津條約) was signed between Ch'ing and foreign countries in 1858. Taiwan, at that time was under the control of Ch'ing Dynasty, therefore, foreign missionaries were allowed after that treaty. The first mission after the Dutch, settled in Taioan-hu (台灣府), present Tailam city (台南Tainan), by missionary James L. Maxwell and his assistants (Hsu 1995: 6-8; Lai 1990). Before missionaries arrived Taiwan, there were already several missionary activities in southeast China. They had started developing Romanization of Southern Min and Hakka. For instance, the first textbook for learning the Romanization of the Amoy dialect, Amoy Spelling Book (Tngoe hoan ji chho hak) was published by John Van Nest Talmage in 1852 in Amoy. The first New Testament in Romanized Amoy (Lan e Kiu-chu Ia-so. Ki-tok e Sin-iok) was published in 1873, and the first Old Testament (Ku-iok e Seng Keng) in 1884. In addition, there were several dictionaries, such as the "Chinese-English Dictionary of the Vernacular or Spoken Language of Amoy, with the Principlal Variations of the Chang-chew and Chin-chew Dialects," by Rev. Carstairs Douglas in 1873. The currently most popular Romanized dictionary in Taiwan, "E-mng-im Sin Ji-tian (A Dictionary of the Amoy Vernacular Spoken throughout the Prefectures of Chin-chiu, Chiang-chiu and Formosa)" edited by Rev. William Campbell, was first published in Taiwan by Taiwan Church Press in 1913 (Lai 1990). That Romanization was called Poe-oe-ji in Taiwan. It means the script of vernacular speech in contrast to the complicated Han characters of wenyen. The wide use of Poe-oe-ji in Taiwan was promoted by the missionary Reverend Thomas Barclay while he published monthly "Tai-oan-hu-sian Kau-hoe-po (Taiwan Prefectural City Church News)" in July 1885. In addition to publications related to Christianity, there were some other publications written in Peh-oe-ji, such as "Pit Soan e Chho. Hak (Fundamental Mathematics)" by Ui-lim Ge in 1897, "Lai Goa Kho Khan-ho.-hak (The Principles and Practice of Nursing)" by G. Gushue-Taylor in 1917, and the novel "Chhut Si-Soan ( Line between Life and Death)" by Khe-phoan Ten (鄭溪伴) in 1926. Besides, recently there were a series of novels translated from world literatures into Peh-oe-ji by the members of "5% Tai-ek Ke-oe (5% Project of Translation in Taiwanese)" since 1996. In short, the Peh-oe-ji was the ground of Romanization of modern Taiwanese colloquial writing. Even though there were several different Romanizations for writing Taiwanese, many of them were derived from Peh-oe-ji. Besides, the use of Peh-oe-ji and its derivations were more popular than other systems of Romanization. In the end of nineteenth century and the twentieth century that followed, there were two primary types of orthographic changes in Taiwan. First, there were changes that resulted from the policy of colonial governments. For example, the Japanese writing was adopted as the official written language during the Japanese occupation of Taiwan from 1895 to 1945. Since 1945 the Japanese writing was been replaced by the Mandarin Chinese of the KMT regime. For detailed information regarding the promotion of Japanese and Mandarin, see Huang (1993: 85-123), Tiunn (1974), and Png (1967: 113-189). Secondly, there were changes due to the need of literacy by its users (i.e., the Taiwanese people), such as the movement for colloquial writing (白話文運動) in the 1920s, which was intended to replace the traditional writing of classical Han (文言文wenyan). As a consequence, the so-called New Literature (新文學) was born. It contrasted to the Old Literature, written before twentieth century, in the history of the literature of Taiwan. As for the Taibun movement, since the 1980s, it has primarily been constructed around the colloquial writing. Furthermore, it has deeply involved the issue of relations between Taiwan and China. Generally, the Taibun movement represents the claim of cultural independence from China. There is more introduction to these two movements in the following section 2.3. The reform of the writing system in Taiwan is not a unique case in Asia. We may first look at other reform cases in Han cultural areas, where they had the same historical tradition of using Han characters, and then turn to the case of Taiwan. In summary, the following table 3 will give us a general idea of the relationship between languages and political status since 1624 in Taiwan. * Taiwanese means Hakka-Taiwanese and Holo-Taiwanese here. ** Readers may have different opinions on classifying the political status; the Ch'ing and KMT colonialism presented here are from the perspective of Taibun promoters. Hanji cultural areas, such as Vietnam, Korea, Japan, Taiwan, and China, have used Han characters and the classical Han writing style before twentieth century. However, there were great changes before the advent of the twentieth century. In Vietnam, Han characters and its derivative characters, Chu Nom (字字 喃), which had been adopted as writing systems for more than a thousand years in Vietnam, were officially replaced by the Romanized Chu Quoc Ngu in 1945, the year of establishment of Democratic Republic of Viet Nam. 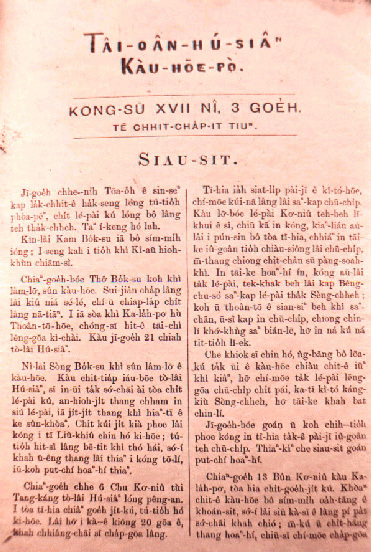 The Chu Quoc Ngu was developed on the basis of Romanized Vietnamese writing, which was originally developed by missionaries in the seventeenth century. In Korea, Han characters were finally replaced by Hangul (諺文) after World War II. Hangul, the Korean script, which analyzes syllables into three parts including initial, middle, and final sounds, was originally designed and promulgated by King Sejong in 1446. In Japan, the syllabary Kana (假名) system was gradually developed after Japan's adoption of Han characters; although Han characters are not completely replaced by Kana, the number of Han characters used by Japanese was decreased from thousands to 1,945 frequently used characters in 1981. As for China, although writing reform has been in process since the late period of the nineteenth century, Han characters are still widely used and taught in the national education system. It seems that Han characters will still be the dominant orthography at least for the present. For more details about writing reforms in the Han cultural areas, please see Chiung (1997), Defrancis (1950; 1977), Hannas (1997), and Taylor (1995). Regarding the reforms in Taiwan, Vietnam, Korea, and Japan, we may examine them in two respects. First of all, from the perspective of domestic literacy and anti-feudalism: China’s main influences on these countries included the use of the Han character, Buddhism, Confucianism, the imperial examination system (科舉制度), and an official government system (文官系統). According to the Han character and the imperial examination system, the books of Confucius and Mencius were accorded the status of classics among scholars and mandarins who assisted the emperor or king in governing his people. Everyone who desired to become a scholar or mandarin had to learn to use Han characters and read these classics and pass the imperial examination, unless he had a close relationship with the emperor. However, the classics were not only difficult to read (i.e., Han characters) but also hard to understand (i.e., the text), because the texts were written in classical Han writing (文言文wenyan) instead of colloquial speech (白話Baihua). In other words, because most of the people were farmers who labored in the fields all day long, they had little interest in learning Han characters. As a consequence, a noble class and a peasant class were formed and the classes strengthened the feudal society. This complication of Han characters could be well expressed with the old Taiwanese saying “Hanji na thak e-bat, chhui-chhiu to phah si-kat (漢字若讀會bat, 嘴鬚就打死結).” It means that you can’t understand all the Han characters even if you studied until you could tie your beard into a knot. In short, the demand for widespread literacy was the advising factor pushing reform of writing systems. In the second half of nineteenth century, Western colonialism came to the Han cultural areas. As a result, China was no longer able to dominate these areas. She was even unable to defend herself from the Western invasions. On the other hand, the rise of modern nationalism against the Western colonialism in these areas, forced those people to consider their national transitions from a feudal society to a modern society. To achieve this purpose, considering a writing reform to reduce the population of illiterate people became an important job. In addition, the nationalism against colonialism, also caused Vietnam, Korea, Japan, and Taiwan, to reconsider their relationships with China. That is to say, they had to maintain the vassal relationship with China or become a politically and culturally independent country. Under the influence of literacy and independence, Vietnam, Korea, and Japan were successful in the great changes from Han character to Chu Quoc Ngu, Hangul, and Kana. However, in China, although there were many proposed orthographic designs since the late period of the nineteenth century, such as Qie-yin-zi (切音字), Quan-hua Zi-mu (官話字母), and Latinization (Zhou 1978), Han characters have been only successfully simplified so far. The pattern of writing reforms in Asia is the same as Gelb mentioned in his famous book about the world's writing reforms, "in all cases it was the foreigners who were not afraid to break away from sacred traditions and were thus able to introduce reforms which led to new and revolutionary developments" (Gelb 1952: 196). Prior to twentieth century, the classical Han writing was the dominant writing system in Taiwan. Most literary works were then written in this system. However, about two decades later under the Japanese occupation, Taiwanese intellectuals started the issue of reforming classical Han writing. They published and argued against the traditional Han writing. Some examples are Teng-chhong Ng's (黃呈聰1922) "Essay on the Mission of Vernacular Writing," and Tiau-khim Ng's (黃朝琴1922) "Issue of Reforming the Classical Han writing." In general, the movement of colloquial writing (白話文運動) from the 1920s to the 1930s centered on two points. First, they intended to reform the complicated classical Han writing (wenyan) and then develop a new writing form, which was based on the colloquial speech (Baihua). Second, they attempted to create a new literature which was based on the new colloquial writing, instead of the old literature which was based on the classical Han writing. (Ou 1985, Iap 1993; Phenn 1992; Lim 1993; Lim 1996; Tiunn 1993). Regarding the claim of reforming classical Han writing, it quickly and successfully aroused a sympathetic echo from the public. Thereafter, it raised another controversy. What language should be the base of colloquial writing? Japanese, Mandarin, or Taiwanese? At that time, Taiwan was under the control of Japan, and the modern Japanese writing was taught through the national education system. It seemed that Japanese writing was the best choice, if considering the economic factors. However, Japanese was not the vernacular of the Taiwanese people. Most of the people still used Taiwan languages in their daily life. Therefore, people such as Chioh-hui Ng (黃石輝1930) and Chhiu-seng Koeh (郭秋生1931), published "Why not Promote Homeland Literature?," and "A Proposal for Constructing the Taiwanese Language." They advocated that Taiwanese people should use colloquial Taiwanese to write poems, fiction, and so on. In other words, they should assert that the new literature should be written in Taiwanese. In addition to Taiwanese, Mandarin was also proposed by some people such as Ngou-kun Tiunn (張我軍), who had studied in Beijing, China. Because Tiunn thought that Taiwanese vernacular was too vulgar to became a literate language, he advocated using Mandarin as the literate language to create this new literature. As a consequence, the so-called New Literature developed in the 1920s was generally written in the colloquial speech of Japanese, Taiwanese, and Mandarin. Although Japanese writing was the only official written language, writings in colloquial Taiwanese or Mandarin, which primarily used Han characters (these were so-called Hanbun 漢文, Han writing) were still allowed in some particular newspapers and magazines, such as Taioan Binpo (台灣民報Taiwan People's News) until 1937, the year the Japanese started to attack China. In order to win the war against China, Japan promoted the Hong-bin-hoa movement in Taiwan, which strongly forced Taiwanese to identify themselves as Japanese, and then fight for the Japanese against the Chinese. During the Hong-bin-hoa movement, Han writing, which was the symbol of a connection between Taiwanese and Chinese, was then prohibited by Japan. The movement of colloquial writing since 1920s was therefore ended in 1937. 臺邑額載厝餉 磨餉二項 俱始於偽鄭 志載瓦厝草厝共徵得銀一千二百零四兩 數十年來 有片瓦寸草俱無 子姓零落及孤寡不能自存者 亦必按冊拘追… (黃淑王敬《台海使搓錄》) Classical Han writing, from Tai Hai Su Chhai Lok (Memo of Inspection on Taiwan) by Siok-keng Ng of 1737. 現在發財的機會, 是真不少, 也真容易碰到, 巷株式期米, 幾點鍾內, 可以賺到整萬銀, 但這是要有才能和資本, 不是普通人可以夢想的。那些毛管出汗的人, 任伊怎會粒積, 也不過得以免至受餓…(賴和<富戶人的歷史>) Colloquial Han writing, from Pu-hou-lang e Leksu (History of A Rich Guy) by Ho Loa around 1940. Although the colloquial writing movement successfully converted the traditional classical Han writing to modern colloquial writing, Han characters still were the dominant orthography. There were only a few colloquial writing promoters such as Poe-hoe Chhoa (蔡培火1927), who pointed out that colloquial writing in Han characters was still a heavy burden for most Taiwanese. He therefore advocated using Taiwanese Romanization to liberate the illiterate. He mentioned about the relationship between new Taiwan and Roman scripts in his book "Opinions on Ten Issues," which was published in 1925. We Taiwanese have 3.6 millions of population, but only two hundred thousand of them are literate. Isn't it too few? What are the reasons? One is that we think little of literacy; another reason is that the ruler is not sincere to promote education; and the third is that the orthography (i.e., Hanji) and language are too difficult to learn literacy. In order to improve our culture, to liberate our people, the Taiwanese language is our best weapon, rather than Hanbun or Japanese… The only 24 scripts in the Taiwanese Romanization is much more useful than 240 thousands of soldiers. The term "Taibun movement" adopted in this paper is used to specify the language movement from the mid-1980s to the present (1999), which reveals the upsurge in promoting standardization for Taiwanese languages, and the promotion of Taigi literature (台語文學). Taibun (台文), on the grounds of its characters, means modern Taiwanese writing or Taigi writing. It was created in contrast to Zhongwen (中文), which means modern Mandarin Chinese writing. As the colloquial writing movement became allied with the political movement in the 1920s, the Taibun movement also occurred along with the rise of the native political activities against the foreign KMT regime in the middle of 1980s. Generally speaking, the Taibun movement consists of two dimensions: the linguistic and the literature dimensions. From the linguistic dimension, vernacular education and standardization of written Taiwanese are the two primary goals of Taibun promoters. From the perspective of literature, the Taibun movement attempts to link to the issue of Taiwanese writing, which occurred during the colloquial writing movement in the early period of twentieth century, and then establish Taigi literature. From the linguistic perspective, Taiwanese people are concerned about vernacular education and standardization of Taibun. Since the 1980s, more and more Taiwanese people have become aware that they are losing their vernaculars. Therefore, they have protested against the monolingual policy of the KMT. There are several organizations devoted to the vernacular languages, such as Tai-Bun Thong-Sin (台文通訊Taiwanese Writing Forum) organized in 1991, Taioan Gibun Hakhoe (台灣語文學會Association of Taiwanese Languages, 1991), Haseng Taioan Gibun Chhiokchinhoe (學生台灣語文促進會STAPA: Students Taiwanese Promotion Association, 1992), Taigibun Thuitian Hiaphoe (台語文推展協會Taiwanese Development Association, 1995), and others. They claim the right to use Taiwanese in public places and in mass media, and that they have the right to carry out vernacular education. In addition, they advocate writing in Taiwanese languages. They hold workshops and Taigi camps, and they have issued several publications and awards of Taibun. It won't be successful and meaningful to standardize Taibun without the fundamental promotion of universalizing Taibun. In other words, it is impossible to achieve the standardization until we have universalized Taibun. Language and orthography are the products of a society; we need all members' participation, not only the linguists, in the use of Taibun. 1. To enhance the Taiwanese people's ability to think in Taigi. 2. To enhance the Taiwanese people's abilities in writing and reading in Taibun. 3. To advocate the use of Taibun in mass media. 4. To establish connections and cooperation among Taibun promoters. In addition to TBTS, other groups such as Han-chi Si-sia (蕃薯詩社Yam Poetry Society) was established by some Taiwanese writers in May 1991. They claimed that their purposes were "to create the Taiwanese literature in the native Taiwanese languages (用台灣本土語言創造正統的台灣文學)," and "to achieve the standardization and literaturization of Taigi (追求台語文字化與文學化)" (Lim 1996: 97-99). There are two main factors, which play an important role in the standardization of Taibun. They are: the promotion of universal Taibun, which we have talked about above; and the wide use of computers and electronic networks in the 1990s. Before wide use of computers and electronic networks, many unique Han characters were designed by different Taibun users. For instance, "勿," which means "no," was combined with "會," which means "able," to represent the new character "勿會," which means "unable" in Taigi. However, those new characters don't exist in the Big-5 Han character set, which is the standard character set for Mandarin software in Taiwan. Even though there have been several Taigi software programs developed since the early 1990s, the compatibility between Taigi software and other dominant Mandarin software programs is still a great problem. Therefore, the new characters either were added by hand or ignored by editors of periodicals. That is to say, most of the layouts of Taibun works were not legible and not aesthetically pleasing to readers. Thereafter, more and more Taibun writers decided not to use or create new characters. In other words, they now limit their Han characters to the stock of the regular Big-5 character set. The orthographic designs other than Han character and Roman script, such as Ganbun (諺文) disappeared quickly because they do not have technical support in Mandarin software dominated society. In the perspective of literature, the Taibun movement since the 1980s has attempted to connect itself with the issue of Taiwanese writing during the colloquial writing movement in the early period of the twentieth century, and then establish so-called Taigi literature, which represents the essence of literature in Taiwan. Generally speaking, the debates on literature before the 1980s, during KMT's occupation, focused on the formation of Taiwan Literature (台灣文學) versus China Literature (中國文學). After that, it raised another debate on the relationship between Taigi literature (台語文學) and Taiwan Literature in the late 1980s. Under the colonial rule of KMT, not only was vernacular writing suppressed, but even literary works about the Taiwan society, which were written in Mandarin Chinese by native Taiwanese writers were not recognized as Taiwan Literature. They were belittled as so-called "Literature of Home Villages (鄉土文學)." In other words, literature in Taiwan was treated as a branch of China Literature (i.e., it was regarded as the frontier literature within the larger frame of China Literature). Thereafter, in the 1980s, as soon as the rise of the native political movement and the debates on Taiwanese consciousness versus Chinese consciousness were becoming more common, more and more Taiwanese people started to recognize the national status of Taiwan Literature. In other words, the derogatory term "Literature of Home Villages" was replaced by glorious Taiwan Literature, which exhibits equality with China Literature. Consequently, Taiwan Literature acquired the national status it deserved in the 1980s (Phenn 1992; Iap 1993; Tiunn 1993). Why does immortal work still not occur in the literature of Taiwan? There are some factors, one is that our writers ignored and looked down our own mother tongue because they were not confident of their vernacular. How could a writer without any confidence create an immortal work? Consequently, they had to subordinate themselves to Chinese culture and become the slaves of Chinese literature. So, today, we Taiwanese writers have to devote ourselves to literary works in Taigi. Then, we will be able to describe our world in our mind. Taiwan Literature must be written in Taigi…Taiwan Literature is the literature written in the mother tongue of Taiwanese people…Taiwan Literature is Taigi literature. We could say that Taiwanese languages are regarded as important components of Taiwan Literature by Taibun writers. Therefore, they asserted that Taiwan Literature must be based on Taiwanese languages. Moreover, some writers, such as Chong-goan Lim and Iong-bin Lim, claimed that Taigi literature is the essence of Taiwan Literature; only Taigi literature can well represent the literature of Taiwan (Lim 1991; 1994). Indeed, in normal cases, the fact that national literatures were written in their vernacular languages is not at all surprising. For instance, the Japanese language is the main literary language in Japan, and Japanese writing represents the essence of Japan literature. The situation is the same as Vietnamese in Vietnam, Korean in Korea, English in Britain, American English in the United States, German in Germany, and French in France. However, it seems that the vernacular writings in colonies do not have such fortune as they have in Japan and other independent nations. While "Taigi literature represents Taiwan Literature" was the claim, some Mandarin writers, such as Kiau Li (李喬1991) and Sui-kim Phenn (彭瑞金1991) argued that language is not an important component of literature. They asserted that literary works in any language could be Taiwan Literature. In other words, both Li and Phenn recognized the legitimate status of Mandarin writing for the literature of Taiwan. In short, the contemporary Taibun movement since the 1980s reflects Taiwan's socio-political complexity and its colonial background. From the perspective of Society and literacy, Taiwanese languages are the vernaculars of most Taiwanese people. They are justified in the use of vernacular writing. However, Taibun and Taiwanese languages were politically ignored by the KMT's inflated national frame (i.e., the Republic of China). For example, Taibun was excluded from the national education system of ROC. As a consequence, most of Taiwan's young generation are now only skilled in Mandarin writing. Whether or not Taiwanese people are willing to accept or shift to Taibun deeply depends on people's national identity and their attitudes forward a new orthography. There are probably more than a hundred orthographies designed by different persons who were enthusiastic for the standardization of Taibun. However, most of the designs were probably accepted and used only by their own designers. Moreover, many of them were never applied to practical Taibun writing after they were designed. Those orthographic designs may be divided into two groups based their graph constructions: First, Han character script; second, non-Han character script. Non-Han character may be further divided into two types. New phonetic script, such as Ganbun designed by Ui-jin Ang, or ready-made phonetic script, which makes use of the present Roman alphabets or Bopomo (ㄅㄆㄇ) to write Taibun. Even if designers use the identical Roman alphabets, they may have different spelling systems, such as Peh-oe-ji, Dai-im (台音式) , TLPA, PS daibuun (普實台文) and Kho-kun (科根). Owing to the wide use of the personal computer and electronic networks in Taiwan since the 1990s, most orthographic designs, which need extra technical support other than regular Mandarin software, couldn't survive. Therefore, the majority of recent Taiwanese writing systems were either in Han characters, Roman alphabet or a mixed system with Roman and Han. First, the same etymon (this is so-called 本字 "pun-ji; ben-zi" ) is written with the same Han characters, such as "想 (siunn: think)" in the sentence "蚊仔想著足怨切." The meaning of 想in Taiwanese is the same as in Mandarin, Vietnamese, Korean, and Japanese (their pronunciations are different). In other words, 想is the graph expressing the Taiwanese word siunn. Therefore, 想was adopted in the sentence. It sounds easy to use pun-ji for all such cases; however, different users may have different opinions on defining pun-ji. For instance, the commonly used character for "person" is "人." However, some scholars, such as Ang, argued that the historical 'true' form for "person" should be "儂." Second, the meaning of a character is ignored; only the sound is attended to. This method is called 假借 (ka-chioh; jiajie). For example, "足 (chiok)" is supposed to be the meaning of "foot" in classical Han writing, however, it means "very (chiok)." Third, the pronunciation of a character is ignored, and its meaning is borrowed to express the same meaning in different languages. This method is called 訓用 (hun-iong; xunyong). For example, the meaning of "蚊" was borrowed to express "mosquito (bang)." The main reason for using Romanization is because its economy and learnability compared to Han characters, which may require a couple of years to be able to read and write. For instance, there were totally 47,035 different Han characters collected in the Kangxi Dictionary (康熙字典1716). However, an ordinary literate Chinese person knows and uses somewhere between 3,000 and 4,000 Han characters (Norman 1991: 73). An elementary school student in Taiwan may know around 2,669 characters after sixth grade. 1. The way of using representative alphabets for consonants and vowels. For instance, the consonants [p t k] of IPA were phonologically transcribed into <p t k> in the Peh-oe-ji system, but they were presented with <b d g> in the system of Dai-im. 2. The use of diacritic symbols for suprasegmentals. For instance, the symbol "^" represents the fifth Taiwanese tone in Peh-oe-ji. Therefore, "bun" means "文," but "bun" was presented with "bun5" in TLPA, and "buun" in PS daibuun. Besides, some people may just use "bun" without considering the tones. 3. The way of spelling. For example, the word "*緣投 (handsome)" was spelled "ian-tau" in traditional Peh-oe-ji. However, "ian" may be spelled "en" today. Besides, the whole word "ian-tau" may be spelled "iantau" without a hyphen between syllables. There are two main reasons why the Han-Roman mixed orthography arose in the late 1980s. First, there is difficulty that some writers use different Han characters for the same Taiwanese word. The existence of various characters for identical words has reduced reading efficiency, and made the readers likely to confuse the meaning of sentences. Second, because most Taiwanese are skilled in using Han characters instead of Romanization, texts in Roman-only scripts may reduce their fluency in reading. Therefore, there is a compromise between Han-only and Roman-only (i.e., mixed orthography). That is to say, when a writer is not comfortable with the Han characters of particular words, then s/he may write down Roman script to represent the words. Because different writers may have different degrees of comprehension of Han characters, the percentage of Roman script used in a text varies from person to person. Generally speaking, the Han-Roman orthography (漢羅) is the most common style for writing Taibun in the contemporary Taiwan (1990s). Most Taibun publications are published in Han-Roman. Such as Tai-Bun Thong-Sin, Taigi Hakseng, Taibun Bong-Po, Hakka Thoi-Van-Fa Chon-Khan, and Dai Qi Se Gai. Copyright 2000-2001 by Wi-vun Taiffalo Chiung.